Kia Ora, Welcome. These were our first words in Maori. In this indigenous language New Zealand is known as Aotearoa, “Land of the Long White Cloud” or “Land of a Thousand Loves”. 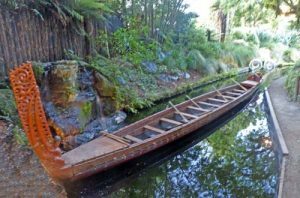 It was in the North Island that we first encountered the distinctive culture and felt the authentic spirit of the Maori people. 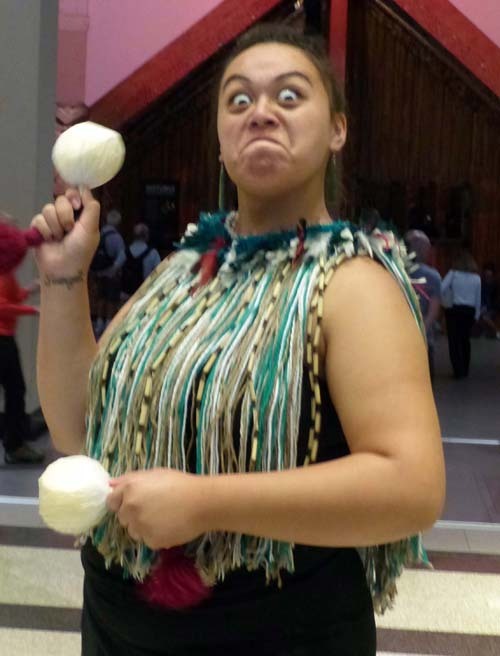 We learned a little about the origins of the Maori People from our tour guide at the Auckland Museum. He told us that over 5,000 years ago many different races of eastern Polynesian people left their native islands to seek Paradise in an uninhabited land. Their destination unknown, these brave seafarers sallied forth against the wind firstly in rough-hewn canoes and later in larger multi hulled boats. Until the arrival of the white man in the 1750s, the Maori only communicated orally, through elaborate storytellings, colourful weavings or intricate wood carvings, often embellished with iridescent paua (abalone) shells. In pursuit of a Maori Cultural Experience, we left Auckland behind us and headed for Rotorua in the Bay of Plenty. 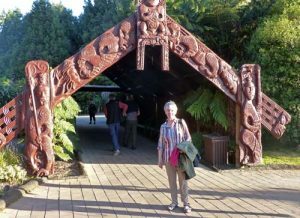 Here we visited the Tamaki Maori Village for an evening of ceremonial rituals, cultural performances and hāngi feasting. We entered the re-created village under a wooden gateway intricately carved with representations of tribal ancestors. Each visiting group or tribe appointed an “honorary chief”. Accompanied by the trumpeting of the conch shell and the stamping of feet, a number of fierce-looking male warriors arrived by canoe for the official greeting ceremony. They were attired in traditional costume … a knee length woven skirt topped by a wide patterned belt. Most exhibited facial and body tattoos and wore neck and ear pendants. They approached the “honorary chief” making loud guttural noises and brandishing sticks and weapons. The head warrior then placed his stick on the ground in front of our “chief”. He, brave man, picked up this peace offering and completed the traditional Maori greeting of a pressing together of noses. Now we could enter the village. We followed our “chief” along an unpaved pathway under a canopy of towering native tawa trees. 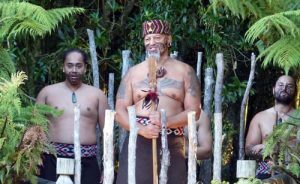 At the first of four stops, the guys in our “tribe” were corralled into performing the haka, a tribal dance symbolic of re-birth. This is performed either to intimidate the opposition or welcome distinguished guests. Our long-suffering male partners attempted to imitate the movements of the Maori warriors as they rolled their eyes, extended their tongues and quivered their hands. The ladies and I enjoyed their valiant efforts. Definitely, more practice was required. The next stop dealt with architectural symbolism and body markings. The red-tinted roof beam of a Maori house represents widespread arms with the sides being the legs. At the apex an elaborate carving of an ancestor’s head is displayed. To the Maori, the colour red signifies power and prestige. We were told that tattooing is considered a sacred art form. Each design composed of curved shapes and spirals is unique. For men, it is customary to have facial markings below the eyes reflecting their cultural identity. Designs above the eyes are only found on a chief’s face. For women, just the chin is tattooed. At the third stop we learned about several time-honoured games. One used poi … a couple of weighted pom-poms joined by two strings. We watched as the young women, one attired in a long faux kiwi feather cloak, swung the poi in graceful, flowing configurations. The main purpose, the girls explained, was to strengthen upper body muscles. Another game, said to improve hand-eye co-ordination, involved four or more people quickly throwing and catching specially carved sticks in various complex patterns. Four members of our “tribe” were coerced into this game with highly entertaining results. Lastly the Maori shared with us the age-old art of laying a “hāngi”. In days gone by, the Maori dug a deep pit or earth oven and filled it with hot stones. They then loaded a basket with selected meats and laid on top of that another filled with a variety of vegetables. Finally the food would be covered with several layers of earth and wet sacking and left for 2½-4 hours to cook. Our mouths were watering as we inhaled the distinctive bouquet. We followed our “chief” to the Meeting House. Seated on several rows of benches we were warmly welcomed. This large structure was ritually decorated inside and out with sculpted images of the tribe’s forebears. It is a place of unity and peace. Lastly we entered the dining room where a buffet of traditional foods had been set out. There was succulent lamb, tasty chicken, roasted potatoes, carrots, kumara (sweet potatoes) and so much more. 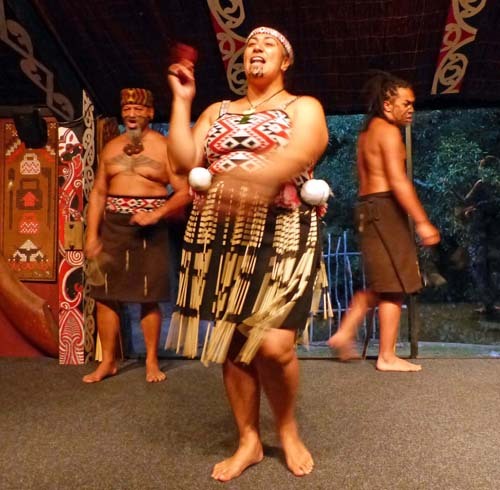 After the customary blessing, we tucked in hungrily while our hosts showcased their heritage by singing love songs and dancing, both key activities in the life of the Maori. The evening meal was topped off by a light, fluffy pavlova topped with peaches and kiwi fruit. What an evening! 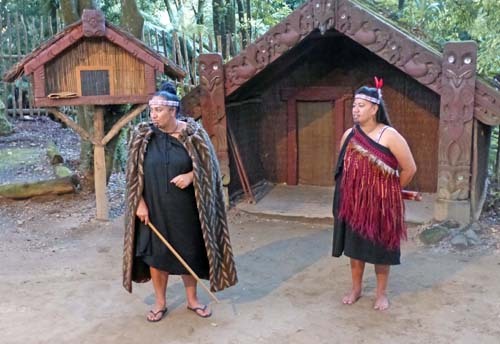 Haera Rā, thank you, to the Tamaki family for inviting us into your village where the ancient customs and fundamental nature of the Maori people live on.